Berry thanks Winthrop for her gift of $2500 to endow a day in honor of her mother. She would love to have the photograph Winthrop offered to place in one of the buildings for the boys and girls to see. She suggests that an additional day could be endowed if Winthrop wished to make a bequest. 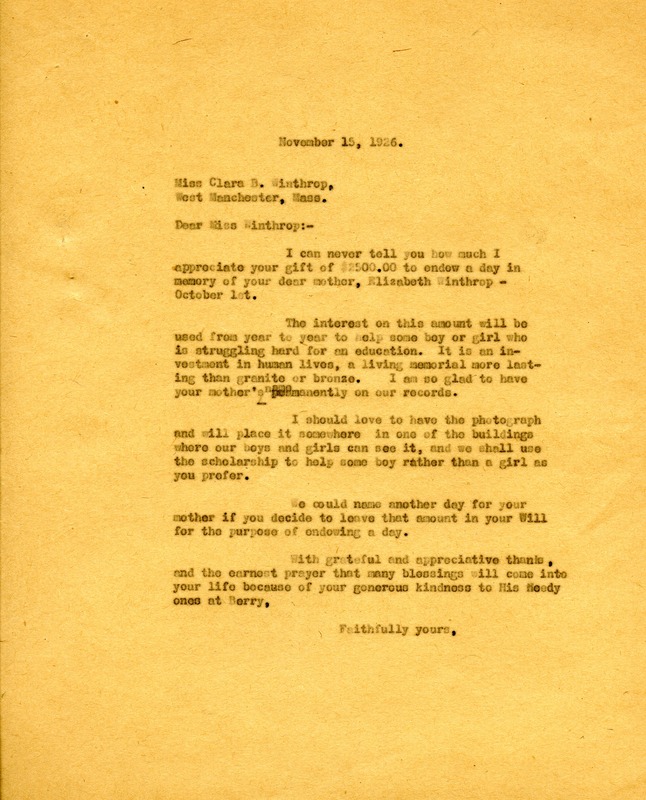 Martha Berry, “Letter to Clara Bowdoin Winthrop from Martha Berry.” Martha Berry Digital Archive. Eds. Schlitz, Stephanie A., Sherre Harrington, et al. Mount Berry: Berry College, 2012. accessed April 19, 2019, https://mbda.berry.edu/items/show/3815.